The Munroe Tavern, a landmark in American history, sits on land that once belonged to John Comee and his wife, Martha Munroe, daughter of the first William Munroe, one of the Scottish prisoners shipped to Massachusetts after the Battle of Worcester in the English Civil War. In 1738 David Comee conveyed twenty-six of his thirty acres, including buildings, to John Overing, who, in turn, sold twenty acres and the Merriam House to John Buckman. 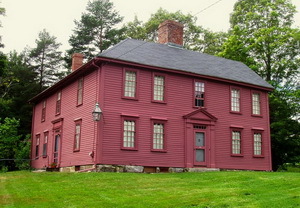 John died in 1763 and his son, John, married Ruth Stone whose father, Samuel Stone, owned what is known now as the Buckman Tavern. John, who was living in what would later be called the Monroe Tavern, had a potash business with his partner Edmund Munroe, who was boarding with him. Edmund was the oldest son of William and Sarah Munroe and great grandson of William Munroe who arrived in Massachusetts as a Scottish prisoner-of-war in 1652. In 1770 John Buckman conveyed to Edmund’s younger brother William Munroe, a cooper, the “mansion house, barn, workhouse, three-fourths of a potash house with works belonging to it, and 26 acres of land.”2 This William Munroe was the first proprietor of the Munroe Tavern. Additions had been made to the original building at that time and the building is essentially the same now as it was then. William was married to Anna Smith, of Lexington and they had, by 1778, five children, two sons and three daughters. The eldest son, William, was "killed by the upsetting of a stage in Richmond, Virginia. "3 The other son and youngest child in the family, Jonas Munroe, would take over the tavern from his father in 1815. With the coming of the railroad, the drovers and their animals, the stagecoaches and the freight teams slowly disappeared and the public houses began to close. Jonas kept the tavern until it closed in 1848. It is not known when Jonas died. Photograph, top: Munroe Tavern, Lexington, Massachusetts, by David Ward, 30 June 2003. Used with permission. 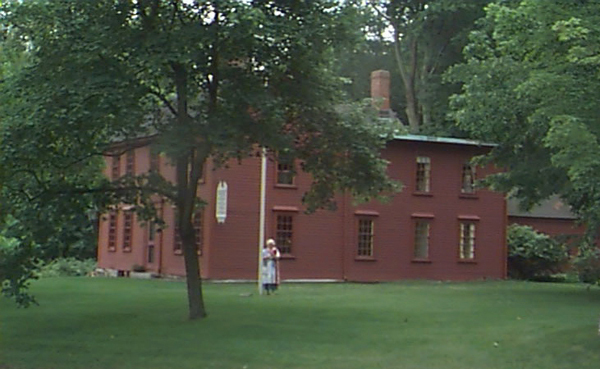 Photograph, bottom: Munroe Tavern, Lexington, Massachusetts, 12 July 2005. From Wikimedia Commons and licensed for reuse under the Creative Commons License. “The Munroe Tavern,” written by Albert W. Bryant in 1902 and read by Dr. F.S. Piper, October 11, 1904, Proceedings of the Lexington Historical Society and papers relating to the history of the town, presented at some of its meetings, vol. III, Lexington Historical Society, Lexington, Massachusetts, 1905, p.142. History of the Town of Lexington, Middlesex County, Massachusetts From Its First Settlement to 1868, vol. II Genealogies, by Charles Hudson, Boston: Houghton Mifflin, 1913, p.462. The Battle of April 19, 1775, in Lexington, Concord, Lincoln, Arlington, Cambridge, Somerville and Charlestown, Massachusetts, by Frank Warren Coburn, Lexington, Massachusetts, The Author, 1912. Proceedings of the Lexington Historical Society and Papers Relating to the History of the Town, Presented at some of its meetings, vol. III, “The Munroe Tavern,” written by Albert W. Bryant in 1902 and read by Dr. F.S. Piper, October 11, 1904. Lexington, Massachusetts: Lexington Historical Society, 1905, pp.142-154. Hudson, Charles. History of the Town of Lexington, Middlesex County, Massachusetts From Its First Settlement to 1868, vol. II Genealogies. Boston: Houghton Mifflin, 1913. Sullivan, E.O. Time & the Tavern: The Munroe Tavern, Lexington, Massachusetts. Lexington, Massachusetts: Lexington Historical Society, 1993. Coburn, Frank Warren. The Battle of April 19, 1775, in Lexington, Concord, Lincoln, Arlington, Cambridge, Somerville and Charlestown, Massachusetts. Lexington, Massachusetts: The Author, 1912. Phillis, Michael. "Lexington's Munroe Tavern to be reborn as British museum. Wicked Local/Lexington, 28 Mar 2011. Webpage: Lexington Comprehensive Cultural Resources Survey, Area AD – Sanderson House/Munroe Tavern.